There are a lot of great ways to modernize your bathroom. However, all those beautiful tubs and showers that you see in the magazines focus on traditional showers and tubs. What if you need something else from your bathroom? Walk-in tubs are a huge asset to seniors who want to remain independent in their own homes. They are also helpful to younger adults who have mobility issues. Unfortunately, walk-in tubs aren’t exactly known for being modern and stylish. You aren’t doomed to have an ugly bathroom that looks stuck in the past because you need an accessible option. There are many ways you can elevate the look of your space with modern details when you have a walk-in tub. The popularity of colors come and go. That’s why so many people installed powder pink tubs decades ago, but everyone wants to get rid of them today. If you’re installing a walk-in tub with your bathroom remodeling project, choose a tub in a solid, neutral hue. Colors like white and off white will never go out of style. One of the best ways to modernize your walk-in tub is to enhance it with a surround. Not only will it finish the space, it can provide you with protection from leaks, mold, and mildew in the future. Just make sure you choose the right surround. Neutral acrylic surrounds are the quickest and easiest way to surround your tub. The best part is, they are designed to mimic the look of other, more luxurious materials. Choose a surround that mimics the look of natural stone and your tub will look fresh and new for years to come. The little things can have a huge impact on the look of your space, but they can also impact your experience in the bathroom. That’s why you should pay attention to the accessories and features you choose for your remodel. Built-in shelves will elevate the look of your space, as will luxury shower heads from the industry’s top brands. 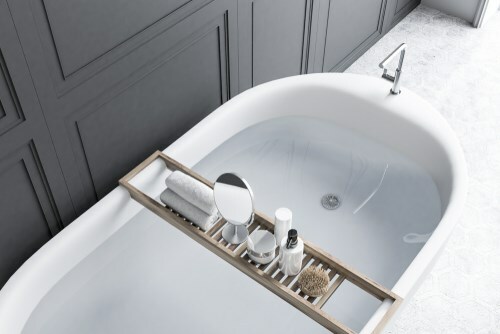 Add jets to your tub for an even more relaxing experience! A spa-like experience in the bathroom doesn’t have to mean installing a traditional tub or shower. Contact Luxury Bath Technologies, and we can help you customize a modern walk-in tub for your space.